There were 22,988 accidents and 80 deaths involving cyclists in London over five years, according to Department for Transport (DfT) figures. Elephant and Castle roundabout in south London was the worst accident blackspot with 80 accidents involving cyclists between 2009 and 2013. 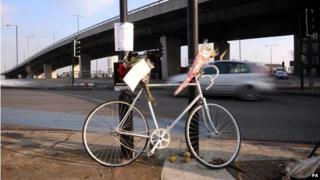 DfT figures analysed by insurers Aviva showed cycling accidents within the M25 reported to or attended by police. Transport for London said any accident was "one too many". In a statement, it said: ‎"While we don't recognise the interpretation of these figures, we entirely agree that any accident on London's roads is one too many. "That is why we are investing nearly £1bn in upgrading the existing Cycle Superhighways with greater segregation, introducing major new segregated cycle routes and backstreet Quietways, and overhauling dozens of junctions on both our roads and on borough roads." In March 2014, the London mayor's office announced a £4bn plan to revamp London's roads, including a new road layout, with more cycle lanes at Elephant and Castle roundabout. Central London's Trafalgar Square had the second highest number of motor accidents involving cyclists, with 46 recorded over the five-year period. Liberal Democrat London Assembly Group leader Caroline Pidgeon said: "With such appalling figures as this it is simply shameful that year after year Transport for London have repeatedly spent just a fraction of their allocated budget on vital improvements to junctions and investing in cycling infrastructure." There have been four cyclist deaths in London in 2015, all involving lorries, with the most recent being last week in Victoria when a mother-of-two died. Earlier in February a three-fold increase in the number of fatalities on the capital's roads prompted Scotland Yard to reintroduce its highway safety operation. Operation Safeway will see 600 officers deployed at 166 junctions during morning and evening rush hours for six weeks. Officers will target road users committing traffic offences.